GREEN BAY — Mike McCarthy’s emphasis on special teams was on display in the first practice of training camp on Thursday morning. The Packers head coach was more than an observer during a punt drill. He met briefly with punter Tim Masthay, who’s competing for his job, moved about the drill and even jogged with the players to a spot on the field where the Packers began practicing kick coverage. Shortly after last season ended, McCarthy announced he would have a greater involvement in special teams in 2015. Meanwhile, star wide receiver Jordy Nelson and cornerback Casey Hayward participated in Thursday’s practice, after missing spring drills while rehabbing hip and foot injuries. Undrafted free agent cornerback LaDarius Gunter made a splash in the opening practice when he made a leaping interception of an Aaron Rodgers pass intended for Jared Abbrederis. 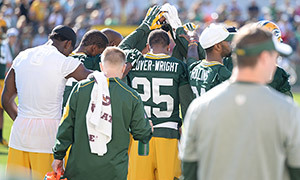 Packers.com will update this story with details from McCarthy’s post-practice press conference.